We shared with everyone the ONF’s new Strategic Plan back in March, and since then our community has been hard at work kicking off all the new initiatives called for in the plan. Our operator leadership has been making great progress, and we want to take a moment to summarize where we are and how it is all coming together. First off, ONF’s operator leadership, which includes AT&T, China Unicom, Comcast, Google, Deutsche Telekom, Telefonica, NTT Group, and Turk Telekom, have agreed on a focused set of open source Reference Designs they communally plan to take to deployment in the near future as they begin to build out their edge & access clouds. 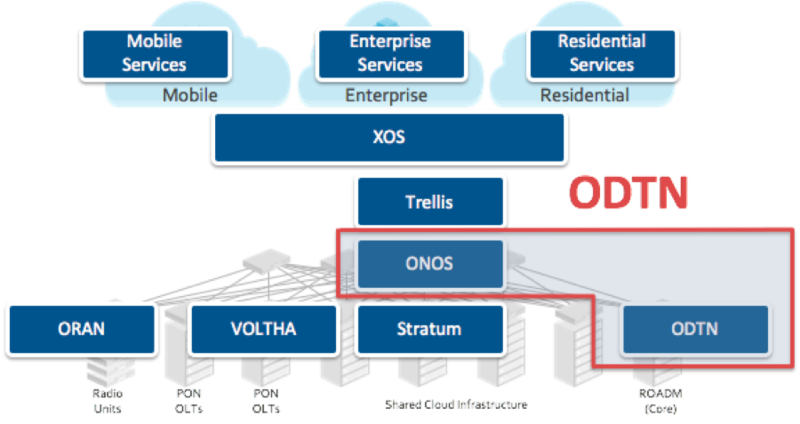 Reference Designs are “blueprints” for how to put common modular components together to create platforms based on open source to address specific deployment use cases for the emerging edge cloud. SDN Enabled Broadband Access Lightweight reference design based on a variant of R-CORD. Supports a multitude of virtualized access technologies at the edge of the carrier network, including PON, G.Fast, and eventually DOCSIS and more. NFV Fabric-RD SDN-native spine-leaf data center fabric optimized for edge applications. 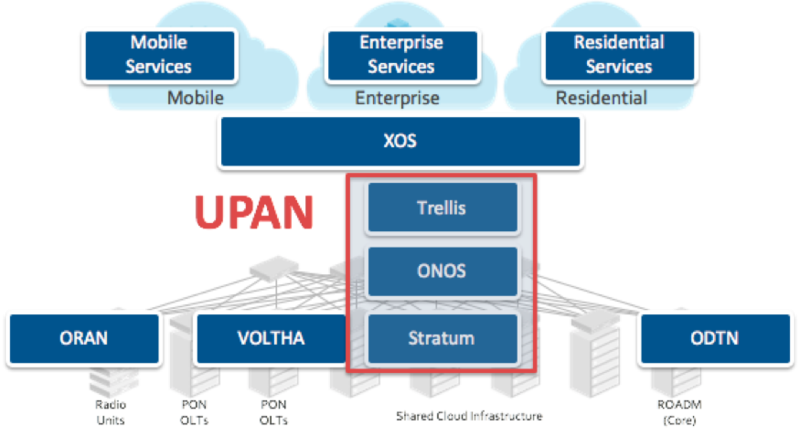 Unified, Programmable & Automated Network Next generation SDN reference design, leveraging P4 to enable flexible data plane programmability and network embedded VNF acceleration. Operator Group ONF board member operators planning to roll out production deployments based on the RD and investing significant resource to realize both the RD and deployments. Supply Chain Partners: ONF supply chain partner companies committed to working with the operators to realize the RD and the Exemplar Platform. Furthermore, these partners will then be positioned to provide solutions to the market based on these Exemplar Platforms. Exemplar Platforms are open source platform implementations, one for each reference design, designed to make it easy to download, modify, trial and deploy an operational instantiation – and thus speed up adoption and deployment. Each EP will leverage upstream open source projects (both hardware and software) from both the ONF and beyond. Description Lightweight platform based on a variant of R-CORD. Supports a multitude of virtualized access technologies at the edge of the carrier network, including PON, G.Fast, and eventually DOCSIS and more. Supports both residential access and wireless backhaul, and optimized such that traffic can run ‘fastpath’ straight through to the backbone without requiring VNF processing on a server. 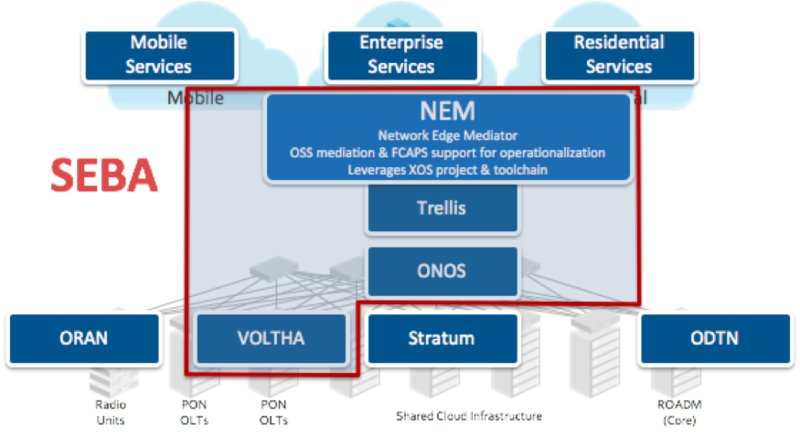 Includes NEM – Network Edge Mediator, which leverages the XOS toolchain to provide mediation to different operators’ backend management/OSS systems and FCAPS support to operationalize the platform. Deployment Status Small pre-SEBA (R-CORD) deployments are already starting to modestly scale. These will be realigned with SEBA over the next few months. Description SDN-native spine-leaf data center fabric optimized for edge services and applications. Description Next generation SDN platform, leveraging P4 to enable flexible data plane programmability and network embedded VNF acceleration. CORD is the summation of the ONF’s edge cloud work, integrating all the related projects and bringing together all the access technologies into a single edge cloud. Furthermore, CORD’s forward looking R&D is looking at enabling third-party edge applications to run on the carrier’s network, creating the infrastructure for an ‘app store’ for the carrier’s edge cloud. The emphasis on reference designs and exemplar platforms is not intended to slow momentum on the more forward leaning work taking place within CORD, nor downplay its significance. 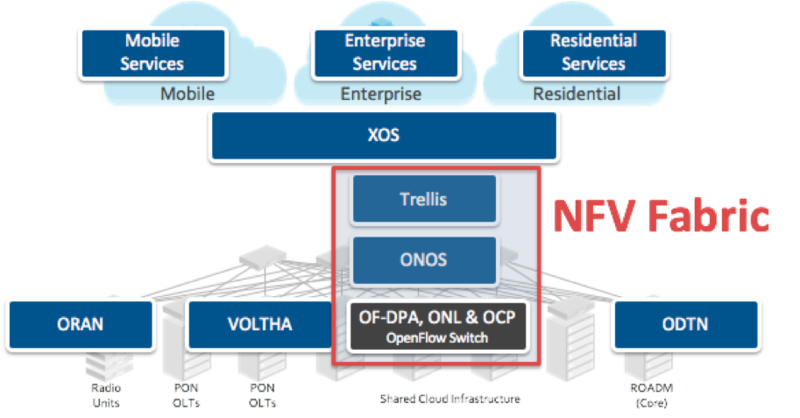 The ONF operators remain passionate about the full CORD vision, but recognize that 5G technologies and edge cloud applications are both still solidifying, and for that reason deployment will follow the initial exemplar platforms. Ultimately, we believe that the opportunity for M-CORD and edge cloud is likely far larger than for the current exemplar platforms combined, and thus this remains critical to the work and mission of the ONF. This new strategic plan and the Reference Design activities outlined here have attracted new supply chain partners to the ONF initiatives. We are very pleased to welcome ADTRAN, Dell EMC, Edgecore Networks and Juniper Networks as new partners. They are joining and complementing our current supply chain partners Ciena, Intel, Radisys and Samsung. Together this is a powerhouse team with all the necessary skills and experience to deliver next-generation solutions based on open source and white boxes for operators. You can learn about the new partners in a related press release. If you are interested in following this work as it progresses, please be sure you are subscribed to the ONF newsletter.